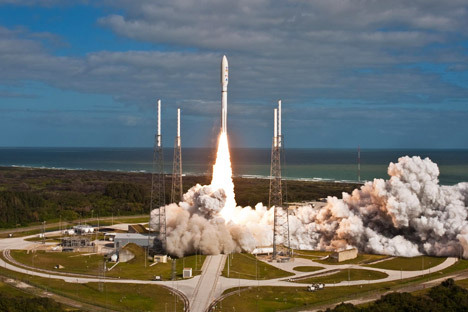 China is interested in buying Russia's RD-180 dual-combustion chamber 400 tonne thrust engines for its prospective super-heavy-lift launch vehicle, a source familiar with the situation told Interfax-AVN on July 7. "The question is at least about buying ready rocket engines, first and foremost, RD-180, or even acquiring a production license," the source said in comment on a statement by Deputy Prime Minister Dmitry Rogozin who said on Monday that China might buy Russian rocket engines. In his words, "the second option is undesirable to us." "It's all about coordination of an intergovernmental agreement on the protection of technologies, and we have an obvious difference here: the Chinese want to use our engine at their own discretion and we cannot do that. Consistent with the missile technology control regime, we bear full responsibility for the use [of this technology] by a country not participating in this regime," he said. At present, RD-180 engines designed and manufactured by NPO Energomash in the Moscow region are supplied to the United States. "The Chinese have chosen the RD-180 engine for possible development of a universal rocket module on its basis, because an [engine] modification for Russia's Rus-M launch vehicle was supposed to deliver a payload to the orbit even in the case of failure of one engine in the first stage's propulsion package," he said. As known, former heads of Roscosmos abandoned the project of a medium-class launch vehicle with increased lift capacity, Rus-M, in favor of Angara. A draft federal space program for the period from 2016 till 2025 does not envisage the development of a super-heavy-lift launch vehicle in Russia. The program only stipulates an upgrade of the heavy-lift launch vehicle Angara-A5 to the Angara-A5B modification with 35 tonne lift capacity.